The EJS Magnetic Field from 2 wires model computes the B-field created by an electric current through 2 straight wires in the z direction with the options of external magnetic fields. The user can click on any part of the 2D space to plot the magnetic field lines. found this fantastic graphics for An animation of the magnetic field and forces generated by two parallel wires is visualized when the current in the wires run in opposite directions. 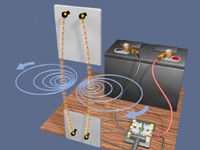 When the current is turned on, the resulting magnet field pressure between the wires pushes them apart.